A top-down approach to management often does not lead to a successful practice. Try letting team members lead the charge instead. Each day at this multidoctor hospital, a different “technician coordinator” sets the schedule and directs the technical staff through the appointments and procedures. Unlike many practices, where veterinar­ians spend chunks of their day deviating from what they’re uniquely qualified to do—diagnose, treat, and prescribe—they focus on clients and patients while the support staff directs them. The practice owner, Dave Cloutier, DVM, swears by this model of staff leverage and autonomy and its positive impact on culture, patient care, client experience, and the hospital’s bottom line. The veterinary industry is plagued by high staff turnover, high stress, and low staff engagement—all of which affect patient care and client experience.1 Add to that the medical service gap and overall poor levels of profitability that many multidoctor practices expe­rience,2 and it’s hard to argue that the current model isn’t broken. For some owners, profitability is still a dirty word, but show me an unprofitable hospital and I’ll show you a clinic that doesn’t practice consistent, thorough, quality medicine or have the resources—including staff, education, and equipment—to perform at the highest level. Like Dr. Cloutier, I’ve witnessed the tangible, posi­tive impact of a management style that taps into the expertise and vision of the practice owner and elevates potential through the buy-in and leverage of the right team members. How can practice owners achieve this? Let’s talk strategy. First, consider your “why.” Is it caring for your patients? Your clients? Your staff? Your family? Next, what is your hospital’s why? Keep in mind that it is not “treating pets like family” or “offering progressive, cutting-edge medicine.” I commonly see those phrases on hospital websites, and although they are worthy goals, they’re not why you do what you do. They’re what you do or how you do it. Set the practice’s why based on your personal why, share it with your team, and expect them to get on board. Provide your team with a platform to share their why so you can craft the hospital’s mission together. After your team has bought into the collective why, one of the hardest parts of the job is done. You’ve given the ship direction and have a crew that buys in. The next step: Evaluate each member’s strengths, weak­nesses, and aspirations to ensure you put the right people in the right seats. This tool can be used at any time, whether you’ve just purchased a hospital or are a seasoned owner with a staff you’ve known for years. When I conduct 360° evaluations, whether at my own hospitals or for others, I use 2 documents. One is a self-assessment completed by each staff member, and the other is an assessment to be filled out by each team member about every other member of the team, owners included. If you’re conducting these internally, you’ll need to work with your manager so that he or she can review your assessments and vice versa. With-out security in confidentiality, this exercise will not work. I ask the staff to place their completed assess­ments in a sealed envelope and deliver them to either me or the manager (or a combination thereof so that I don’t see mine and my manager doesn’t see his). Read through the evaluations with an eye for trends. Is a particular team member consistently praised? Is someone consistently criticized? Also try to better understand what motivates each team member and identify untapped potential or interests that could be beneficial. After reviewing the evaluations, sit down with each staff member. Although I would never share a copy of anyone’s assessment with someone else, I do summarize the trends and use this as an opportunity to praise, coach, and set goals. When administered appropriately, these evaluations create an opportunity to build an inclusive culture, offer valuable insight, encourage mutual respect, and provide actionable improvement opportunities (Box 2). Understanding your team members and making sure they’re in the right positions are paramount to creating an environment conducive to team-based medicine, with each staff member performing at capacity. 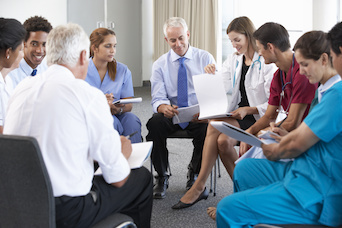 A leadership team is a group of staff members, typi­cally representing each area of the hospital, respon­sible for identifying hurdles and creating solutions with the shared objective of accomplishing goals based on the practice’s why. During the 360° evaluation process, ask the team to nominate 4 individuals (perhaps even themselves) to be part of this team. I typically do not allow veter­inarians or managers to be members of the leader­ship team, because including a supervisor in the mix changes the team dynamic, and staff members tend to take a back seat. Research shows that 89% of leadership effective­ness comes from 4 behaviors6: solving problems effec­tively, operating with a strong results orientation, seeking different perspectives, and supporting others. Your leadership team should consist of staff members who demonstrate these behaviors. When these teams struggle, it’s often because the chosen leaders lack these traits or the necessary structure and guidance were not put in place. Effective leadership teams should also be powerful cheerleaders. Remember, change is hard, even when the staff has requested it. It’s up to owners and lead­ership teams to remain positive, optimistic, and real­istic. In other words, don’t succumb to viewing the world through rose-colored glasses, but be steadfast in leading through hurdles. In the early stages of a leadership team, weekly meet­ings, complete with an agenda and an assigned person to take minutes, seem to work best. Don’t let the size of your practice serve as an excuse not to execute; I’ve seen leadership teams achieve success in hospitals of all sizes. Over time, some teams will meet less often based on the tasks at hand, but I recommend meeting weekly for at least the first 6 months. At my hospital, we start each meeting by affirming the hospital’s why and a shared commitment to the goals at hand. We review our leadership roles, includ­ing ground rules for communication and disagreement as a team; define how we’ll approach new projects; pro­vide status reports on ongoing projects; and then work on that day’s tasks. There should be a protocol in place to review decisions with ownership and communicate relevant projects to the staff after the meeting. This last piece is often overlooked among new leadership teams and can create a them-versus-us mentality. Without proper communication among staff, resentment can build as teammates see themselves as picking up the workload when the leadership team is meeting. Leadership team objectives will vary based on a hospital’s goals, but I rely on teams to brainstorm and help implement strategies to improve daily operations, patient care, client experience, revenue, efficiency, and culture. They gather input, concerns, and ideas from coworkers and decide on the best plan of action. We review the proposed solutions together, and they implement changes and ensure follow-through. The journey toward team leadership management must start with acknowledging that if you’ve picked the right team members, you’re stronger as a diverse unit. Provide guidance and structure, then take a step back. You’ll see your practice reach new heights in staff engagement, productivity, and retention, as well as more consistent and thorough patient care and, ulti­mately, increased financial success. Mr. Keiser is the CEO of Blue Heron Consulting (bhcteam.com). His team of coaches collaborates with new and seasoned practice owners to improve their lives and the lives of their team members while simultaneously enhancing client experience, building sustainable practice profitability, and elevating the quality of care for pets. His passion for veterinary management extends into his role as managing partner in a handful of veterinary practices. 1. Zimlich R. Toxic veterinary teams. DVM360 website. veterinarynews.dvm360.com/toxic-veterinary-teams. Published January 19, 2017. Accessed August 7, 2018. 2. Dicks M. Understanding practice finance analytics. Presented at te Veterinary Leadership Conference. October 23-34, 2017. Chicago, IL. 3. Decision-making styles guide. University of California, Davis website. oe.ucdavis.edu/local_resources/docs/decision-making.pdf. Accessed August 7, 2018. 4. The human era at work: findings from the Energy Project and Harvard Business Review, 2014. Urban Land Institute. uli.org/wp-content/uploads/ULI-Documents/The-Human-Era-at-Work.pdf. Accessed August 7, 2018. 5. 2012 Employee Job Satisfaction and Engagement: How Employees Are Dealing With Uncertainty. Washington, DC: Society for Human Resource Management; 2012:41. 6. Feser C, Fernanda M, Srinivasan R. Decoding leadership: what really matters. McKinsey Quarterly. January 2015. mckinsey.com/global-themes/leadership/decoding-leadership-what-really-matters. Accessed August 7, 2018.